Bell. is a great children’s remedy, particularly indicated in robust corpulent children. It is a remedy for acute convulsion during teething period with fever. Head hot feet cold. Skin burning, hot, bright red face, cold feet. Patient bores his head into the pillow. Convulsions commence in the arm. Spasms are followed by prolonged unconsciousness. Throws body forward and backward. Cannot bear to be touched anywhere. Convulsions re-excited by least touch or draught. Violent convulsions involving every muscle. Contractions of limbs, biting of tongue. Convulsions of head and arm with hiccup. Jerks head suddenly from pillow. Child is rigid as board. All these attacks are aggravated by dazzling and shining lights and objects. The patient also has a fear of water with excessive aversion to liquids. During the attack, face is red and hot with cold hands and feet. Patient fears the dark, yet convulsions worse from light, at night. Paralysis of one side, convulsions of the other side or one-sided paralysis and twitching. Convulsions very easily brought on or renewed by a bright light, running water or by drinking water. Convulsions of infants, of children, especially from fright. Convulsions from worms, after eating, during sleep. One arm will twitch, then the other. Convulsions followed by squinting and disturbances of vision and hearing. There is much twitching, jerking and hunger previous to attack. Falls suddenly to ground with cries and convulsions. Convulsions begin with twitching of the mouth and face and especially of the muscles about eyes. Also useful in convulsions of children, especially after fright and from intestinal worms. Eye balls rolled upward and to left before attack. Head drawn to one side, then back, before attack. Twitching of face muscles, extends to body. 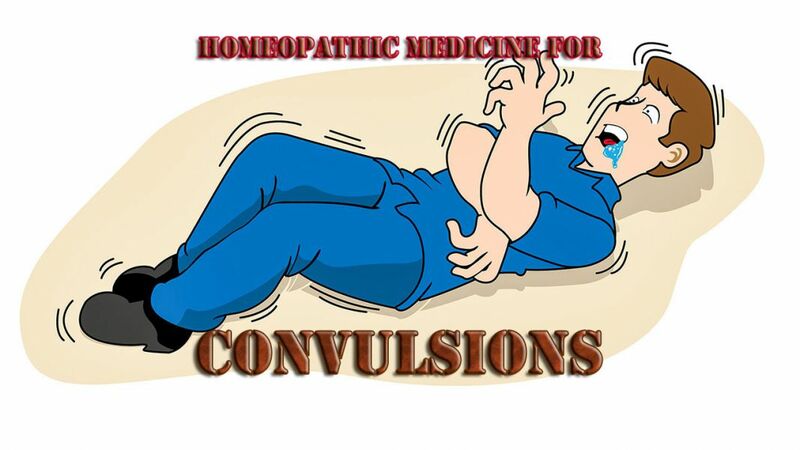 It is one of our best remedies for convulsions. Convulsions from fright, after punishment. After punishment children are convulsed in sleep. Convulsions of children during dentition. Children when reprimanded, scolded, get convulsions in sleep. The child is cold and pale. Trembling of the whole body with frightful convulsive twitching. Convulsions return at the same hour daily. Children throw arms from side to side. Violent screams and motions of hands and feet. Child is very irritable, obstinate, cannot be quieted and is very capricious. Doesn’t want to be touched, has sickly pale face with ring around the eyes. Grates teeth at night. Sleeps on abdomen. Chamomilla is mostly indicated in newly born child and during dentition. Convulsions of children from nursing after a fit of anger in mother, after a fright in mother. During convulsions the body becomes stiff, eyes roll about, face distorted, thumbs turned inwards. Legs moved up and down. Cham. child is very irritable, fretful, peevish, cross, spiteful. Once you ask a question he cannot return a civil answer to you. Wants many things but rejects them when offered. It is very difficult to please Cham. child. He is very sensitive to pain. One cheek red, one pale. Nux. Vom. is useful in convulsions of children, due to fits of anger, allopathic drugging or indigestion. Convulsions with consciousness or semi-consciousness. Convulsions of all the muscles of the body, with teeth clenched and purple face. Convulsions brought on by dazzling light or sight of running water. Convulsions even thinking of fluids of any kind or from slightest touch or draught of air. Convulsions are always associated with throat symptoms. Convulsions from various causes, injuries, from worms, from becoming chilled, from fever, during pregnancy and childbirth. Spasmodic stiffness of the whole body. Eyes are first affected. Eye-balls jerks. Convulsions, the aura either begins in the stomach or about the head or throat and extends downward. Great difficulty of breathing from spasm. During the time of violent attack, there will be frightful distortion of face, limbs or whole body, associated with loss of consciousness. The attack is renewed from slightest touch, noise and motion. Convulsions from fright, punishment. Body stiffens, mouth and face twitch. Face is dark red and bloated. Patient wants cool air, open air, to be uncovered. Worse in warm room, hot bath. Head drawn back nearly to heels or legs and arms spread out. Convulsions are worse from glare of light. Useful in convulsions during pregnancy and puerperal convulsions which begin in the fingers or toes and spread all over the body. Convulsions from worms, convulsions of teething children. Drawing in fingers, clenching of thumb or twitching of muscles. Thumb drawn into palms, fingers close over them, with great violence. Convulsions during acute infective fevers, during dentition. Rolling of head from side to side, grinding the teeth. Whole body jerks during sleep. Aethusa is equally great in convulsions in which the thumbs are clenched, the eyes are turned downward. Eyes look sunken, face red, pupils dilated. Dozing of the child after vomiting, after stool, with convulsions. Great weakness and prostration, with sleepiness. Convulsions affecting the whole left side. Body rigid, stretched out, followed by spasmodic jerking of arms towards each other. Nausea and vomiting before or during spasm. Nocturnal convulsions, especially about the time of new moon. Before attacks the coldness of left side, shaking and twisting of left arm. Useful in teething convulsions, when after Belladonna the convulsions persists. Convulsions in fair, fatty and flabby children. The head is large and sweat profusely, especially in sleep. Chilly, disposed to catch cold very easily. Symptoms appear suddenly, with violence. Falls unconscious without warning. Rolls on the ground from side to side or kicks vehemently with her feet or rolls the head and rubs it to relieve her distress. Rigidity, grind teeth, bites tongue, eyes remain open. Convulsions of children with face pale or blue and cold sweat on forehead. Convulsions at puberty. Convulsions from fright, suppressed eruptions. Violent movements of limbs, jerking with icy coldness of body. Urine flow copiously and involuntarily during convulsions. Nose bleed during convulsions. Useful when attacks occur at new moon.